About this Coin Pouch W / Id Window Split Ring:When headed out for a night on the town, keep the bulky purse or wallet at home and use this promotional pouch instead!It's the perfect size for a few smaller necessities.Offered in several attractive colors, the pouch features a zippered compartment for coins, a clear window to display an ID and a key ring.Great for travel agencies and company giveaways, add an imprinted logo for all to see!Material: Polyester NOTE: Product comes with Prop 65 warning label. Label reads: "WARNING: This product may contain carcinogen, which is known to the State of California to cause Cancer and Reproductive Harm. For more information, go to www.P65Warnings.ca.gov. Special Instructions:Rush Service:May only be used on regular web quantity orders and one color imprints. About this Insurance Card Holder:Play all the right "cards" with this promotional insurance card holder.Custom imprinted holder is made with 100% recyclable materials and features a clear view panel, full-length clear pocket with short side opening on back and a second card size clear pocket on front.Card holder measures 4 1/16" x 5 3/4" and holds cards up to 3 3/4" x 5 1/4".Front pocket measures 4 1/8" x 2 3/8" and holds cards up to 3 1/2" x 2".Material: Vinyl NOTE: Product comes with Prop 65 warning label. Label reads: "WARNING: This product may contain carcinogen, which is known to the State of California to cause Cancer and Reproductive Harm. For more information, go to www.P65Warnings.ca.gov. About this Insurance Card Holder - Single Pocket:Use this fantastic marketing tool to "insure" your brand awareness.Our Insurance Card holder features a soft vinyl single pocket with a short side opening.It holds cards up to 3 3/4" x 5 1/4".Made with recycled material; add your logo to this product to stand out within people's piles of mail.This is a great choice for insurance companies.Material: Vinyl NOTE: Product comes with Prop 65 warning label. Label reads: "WARNING: This product may contain carcinogen, which is known to the State of California to cause Cancer and Reproductive Harm. For more information, go to www.P65Warnings.ca.gov. About this Standard Size Card Holder With 2 Pockets:Display, store, and distribute your business cards with this handy little promoter!Constructed of recyclable vinyl, this standard size card holder features two clear vinyl card pockets, holding cards up to 3 1/2" wide and 2" high.These handy retrievers are also ideal for storing grocery store cards, debit cards, school ID's and much more.Material: Vinyl NOTE: Product comes with Prop 65 warning label. Label reads: "WARNING: This product may contain carcinogen, which is known to the State of California to cause Cancer and Reproductive Harm. For more information, go to www.P65Warnings.ca.gov. About this Alice Media / Card Stand:Convenient multi-use desktop stand holds your media tablet, mobile phone or business cards and includes 50 1 5/8" x 1 13/16" sticky notes and 50 sticky flags. Finish / Material: Plastic.Special Instructions:Rush Service:1. Purchase Order must clearly state artwork instructions and logo to be used.2. One Color/One Location Imprint Only. About this Terni Business Card Case:Steel business card case with curved leatherette magnetic hinged cover. Finish / Material: Leatherette, Stainless Steel.Special Instructions:Rush Service:1. Purchase Order must clearly state artwork instructions and logo to be used.2. One Color/One Location Imprint Only. About this Cambridge Card Holder Notebook:Business card holder notebook with 70 lined paper pages and durable plastic cover. Finish / Material: Plastic.Special Instructions:Rush Service:1. Purchase Order must clearly state artwork instructions and logo to be used.2. One Color/One Location Imprint Only. About this Revello Passport Cover:The Revello Passport Cover is designed to hold a US passport or Canadian passport and is perfect for those who travel internationally or domestic. Includes a pen loop. Material: Italian UltraHyde. Manufactured By Leeds.Special Instructions:Other imprint methods/areas may be available; please call for details. Please note that product images may not depict the standard imprint method included in pricing. About this Calculator Business Card Holder With Pen Included:Includes solar calculator with business card holder/dispenser.Silver metal twist ballpoint pen with blue ink.A pen imprint not available.Material: Plastic.Special Instructions:1 Day Rush, available upon request for 1 color, 1 imprint location orders. About this Leatherette Business Card Case:Business card case has a carbon fiber pattern, engraving plate, protective metal card storage and snap closure. Finish / Material: Leatherette.Special Instructions:Rush Service:1. Purchase Order must clearly state artwork instructions and logo to be used.2. One Color/One Location Imprint Only. About this Plastic Business Card Holder:Business card holder features a flip-top opening.Material: Plastic.Special Instructions:1 Day Rush, available upon request for 1 color, 1 imprint location orders. 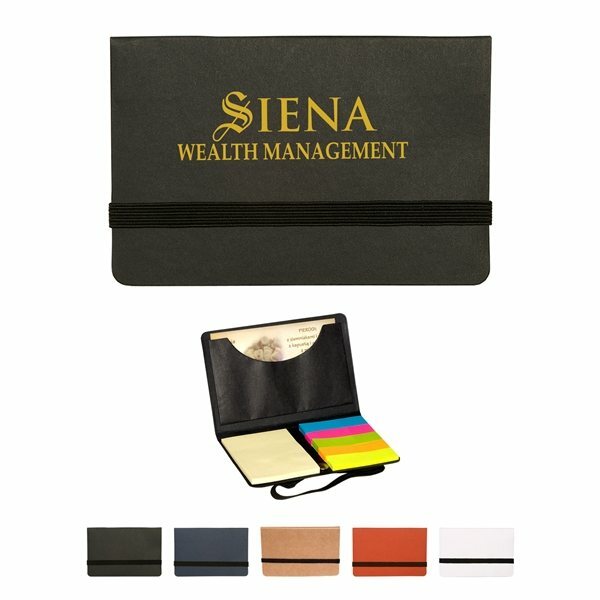 About this Skeda I - Business Card Case:Elegant two-tone silver finish business card case has an arched lid and snap closure. Finish / Material: Metal. Business Card Case. Snap Closure.Special Instructions:Rush Service:1. Purchase Order must clearly state artwork instructions and logo to be used.2. One Color/One Location Imprint Only. About this Business Card Case:Two-piece plastic business card case with slide-on colored cover. Finish / Material: Plastic. Polypropylene Construction. Colored Cover Slides On to Keep Cards Secure.Special Instructions:Rush Service:1. Purchase Order must clearly state artwork instructions and logo to be used.2. One Color/One Location Imprint Only. About this Pisa Business Card Case:Steel business card case features a soft felt interior, magnetic flap closure, and textured black leatherette cover. Finish / Material: Leatherette, Stainless Steel.Special Instructions:Rush Service:1. Purchase Order must clearly state artwork instructions and logo to be used.2. One Color/One Location Imprint Only. About this Traverse Business Card Holder:Business card holder with mirror finish.Holds approximately 10 business cards.Material: Stainless Steel.Special Instructions:1 Day Rush, available upon request for 1 color, 1 imprint location orders. About this Glory I.D. Holder with Lanyard:The Glory I.D. Holder with Lanyard is a combination ID/badge holder that holds cards up to 3-1/2 inches high by 2-5/8 inches wide and also includes breakaway lanyard.Material: PVC. NOTE: Product comes with Prop 65 warning label. Label reads: "WARNING: This product may contain carcinogen, which is known to the State of California to cause Cancer and Reproductive Harm. For more information, go to www.P65Warnings.ca.gov. Special Instructions:1 Day Rush, available upon request for 1 color, 1 imprint location orders. About this Uberto Desktop Multi - Function Holder:Multi-use desktop tablet / phone or card holder has a steel engraving plate. Finish / Material: Leatherette, Stainless Steel. Leatherette Finish.Special Instructions:Rush Service:1. Purchase Order must clearly state artwork instructions and logo to be used.2. One Color/One Location Imprint Only. 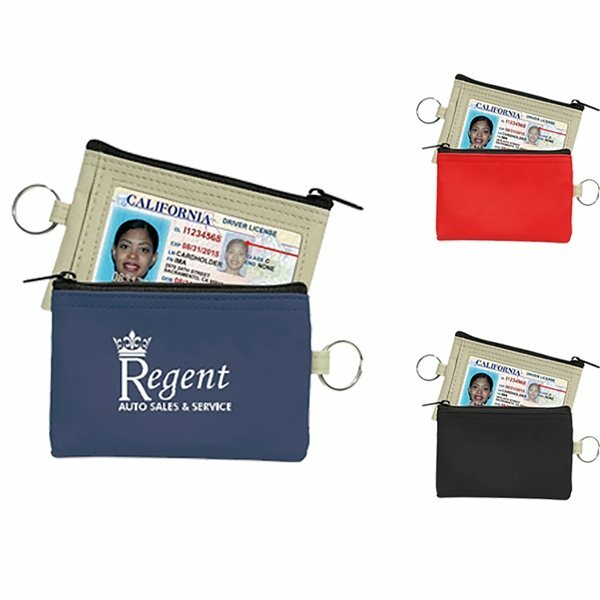 About this ID Holder:Zippered Compartment With Split Ring.Clip For Attachment.Clear ID window On Backside.Special Instructions:Rush Service:Catalog Quantities Only.One Color And One Location. About this Business Card Holder:Aluminum Case.Special Instructions:Multicolor imprint is available, Please call for service.Rush Service:Catalog Quantities Only.One Color And One Location. About this RFID Credit Card Protector:Now many credit cards have Radio Frequency Identification chips inside which offer convenient contactless scanning and information sharing at the cost of security and privacy. This protector will block RFID signals and protect valuable information stored on RFID chips from unauthorized scans or unwanted readers. Material: Plastic.Special Instructions:1 Day Rush, available upon request for 1 color, 1 imprint location orders. About this Aluminum Card Case:6 Inside Pockets To Hold Business Cards, Credit Cards, Cash, Etc.Push Button To Pop Open.RFID Blocking.Special Instructions:Rush Service:Catalog Quantities Only.One Color And One Location. About this ID / Card Holder:Two Inside Pockets.Great For Handouts Or Mailings.Special Instructions:Rush Service:Catalog Quantities Only.One Color And One Location. About this Alicia Klein(R) Business Card Holder:Spread brand awareness at networking functions by passing this out with pre-loaded business cards. Slim design includes 2 business card pockets with convenient clear ID pocket. Manufactured By Leeds. Note: Instructions Included: No Materials: ArisUltHyde Related Search Terms: Business Card HolderSpecial Instructions:Other imprint methods/areas may be available; please call for details. Please note that product images may not depict the standard imprint method included in pricing. About this The Protector Neck Tote:Waterproof travel pouch, Double zipper top closure and double-fold, double-snap closure. Break-away, adjustable lanyard. Keeps valuables safe and visible during outdoor activities.Material: PVC.Special Instructions:1 Day Rush, available upon request for 1 color, 1 imprint location orders. About this Struttura III - Clock Business Card Holder:Clean and simple clock/business card holder in tone-on-tone silver and chrome. Finish / Material: Metal. Business Card Holder. Analog Clock. Tone-on-Tone Chrome & Matte Silver. Heavy Metal Base. 1 SR626SW Battery Pre-Installed.Special Instructions:Rush Service:1. Purchase Order must clearly state artwork instructions and logo to be used.2. One Color/One Location Imprint Only. About this Tablet / Business Card Holder Coin Bank:Convenient multi-use desktop money bank holds your media tablet, mobile phone or business cards. Finish / Material: Plastic.Special Instructions:Rush Service:1. Purchase Order must clearly state artwork instructions and logo to be used.2. One Color/One Location Imprint Only. About this Massa RFID Card Holder:Many ID and credit cards are embedded with radio frequency identification (RFID) chip. The chips allow stores to scan your ID or cards for transactions. However, criminals can also steal your personal data this way. Put your important RFID chipped card in this slim card holder. The RFID blocking sleeve prevents unauthorized access to your card data. There is a front windowed ID pocket, center RFID blocking pocket and two backside RFID blocking card slots. Made from soft leatherette with white contrast stitching. Finish / Material: Leatherette.Special Instructions:Rush Service:1. Purchase Order must clearly state artwork instructions and logo to be used.2. One Color/One Location Imprint Only. About this Desktop Business Card / Note Holder:Desktop Business Card/Note Holder.Special Instructions:Multicolor imprint is available, Please call for service.Rush Service:Catalog Quantities Only.One Color And One Location. About this Execu - Buddy Card And Media Stand:Holds Business Cards, Tablets Or Cell Phone.Leather Look With Metal Plate.Special Instructions:Multicolor imprint is available, Please call for service.Rush Service:Catalog Quantities Only.One Color And One Location. About this Executive Business Card Holder:Stainless Steel And Polyurethane Material Case.Leatherette Texture.Felt Interior.Special Instructions:Rush Service:Catalog Quantities Only.One Color And One Location. About this RFID Data Blocking Fabric Card Holder:Made Of Heathered Polycanvas With Inner Metallic Foil LiningZippered Compartment With Split Ring AttachmentGreat For Money, Credit Cards, Etc.Place Your Credit Cards In Holder To Prevent Cyber Hackers From Stealing Your IdentityPrevents Data Transfer Between The Wallet And ReaderSpecial Instructions:Rush Service:Catalog Quantities Only.One Color And One Location. About this Business Card Case:Soft-touch silicone business card case with thumbslide card ejector, magnetic flap closure and side grips. Finish / Material: Silicone. About this RFID Data Blocker Card:New And Improved Technology.Place The RFID Data Blocker Card In Your Wallet With Your Credit Cards To Prevent Cyber Hackers From Stealing Your Identity.The RFID Data Blocker Card Is Powered By E-Field Technology And Provides The Best Protection Against The Electronic Theft Of Your Credit And Debit Card Data.Prevents Data Transfer Between The Card And Reader At A Range Up To 23 Feet.Works With Any Contactless Chip Card. Cards That Are Swiped Do Not Send RFID Signals And Will Not Be Protected By An RFID Blocker.Attach Your RFID Data Blocker Card To An Optional Full Color Backer Card.Special Instructions:Rush Service:Catalog Quantities Only.One Color And One Location. Thank you Ari, Ira and Chase! Our Business Card Sticky Pack is one of our top sellers. The extra stickies that are included in the business card holder is what makes it special. The Business Card Stick Pack is great for all events! You can give these out to students or employees. They will love the stickies that are included! Includes five assorted sticky page markers and a 2-3/8"w x 1-3/4"h yellow sticky pad,all 25 sheets each. Available in black, natural, navy, red, and white. Thank you Jordan and Summer. We always make sure our products are delivered to you just the way you envisioned. Our Card Holder Notebook is useful for students to use with their school I.D., or employees to use with their work I.D.s. Give your customers something they could use in their daily life. Available in black, blue, red, orange, and lime. Purchase your Card Holder Notebook today! Thank you Sydney and Claire! We’re always happy to read great reviews. We always make sure our promotional products represent who we are, so product reviews like these continue to make us work even harder. When headed out for a night on the town, keep the bulky purse or wallet at home and use this promotional pouch instead! It's the perfect size for a few smaller necessities. Great for travel agencies and company giveaways, add an imprinted logo for all to see! Order your Coin Pouch W/Id Window & Split Ring here. With over 320 business card holders in our selection, you won’t want to miss out on what’s available. We have many options that will fit right in with your company and your logo! From calculator business card holders, to notepads with card holders, our selection has many different types of promotional business card holders. Business card holders are great for everyone! Not only are they useful to carry business cards, but also identification. Allow your customers to store away their important information somewhere safe. Use business cards holders for any trade show, as you hand out your own business card to other marketers. Give them as an employee incentive, so your employees can use them outside of the office! Look through our selection of business card holders. Shop here! At AnyPromo, we place a high standard on brand impact, just like our customers. Search our site for a wide selection of custom business card holders, and see for yourself. Trade show and event guests are bombarded with branded swag at every moment, so it is extremely important to stand out. 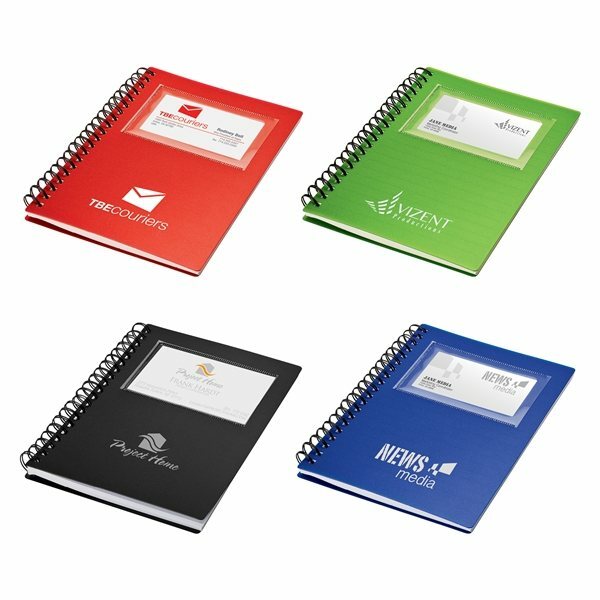 Our custom office accessories are specially priced and proven to generate impressions. Click through our inventory of event business card holders on sale now. The following list of hot items is a snapshot of our selection of 335 choices of custom office products. We’re ready to help expedite your order, so give us a call! Grab your promo business card holders today! Business card holders are great for any event or purpose! Want to give these away? Your customers will love to use these for their own purposes. Whether professional or personal, your business card holder will help keep their information safe. Business card holders are not only great for business cards, but they’re also good for identification. Your customer could use business card holders for many purposes. Let your company logo be part of it! Our featured list of business card holders includes our most hot promotional items. Customers will love to have these! If you have any questions, feel free to call our customer service team. They will love to help you complete your order.